This particular meeting was anticipated by many for a number of reasons. First, because this was the last “official” meeting of all partners and therefore a perfect opportunity for a wrap-up of various activities and planning for the future of common and concluding activities. Second, there were a number of activities that began in the previous meeting in Tallinn and were to be continued on Lesvos. At the same time, Lesvos has been in the spotlight during the past year as one of the global centers of the “refugee crisis”. Many partners understandably expressed concerns over the suitability of the island at the particular time for such a meeting and others displayed interest to contribute. The meeting was held with an open format, based on small workshops rather than long plenary meetings. In the end, eight workshops covered a number of different issues, including the progress of different Working Packages, but also broader issues such as the strategy and the “messages” of HERCULES that will be communicated to policy makers and the funders of the project, European citizens. 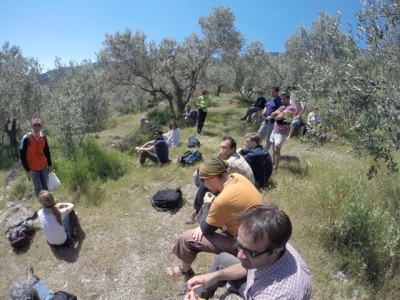 Another objective of the meeting was to familiarize project members with one of the Case Study landscapes of the project, the olive plantations of Gera. So, the last day of the meeting was reserved for some outdoor activities or the in the morning, with a hiking through the landscape (from Mesagros village through Skopelos village, then uphill to Karionas and then downhill again to Mesagros). The weather was nice and although we were walking through a monoculture of olives, the diversity of the landscape was striking, since we passed through plantations with very diverse management regimes, from clear, sprayed understoreys to abandoned, forested fields. This is one of the features that make this landscape a High Nature Value Farmland, but also very attractive and beautiful. At noon, we had a light (in theory...) lunch in Ksenonas in Skopelos that Spiros and his wife prepared for us with traditional dishes for eating while working in the field, including cheese, pies and the famous bar made of sesame seeds, honey and fig paste that was a revelation. After that it was time for the workshop with local stakeholders (mostly farmers) in Pappados. This was the 3rd workshop with a purpose to present the findings of the research work done last summer in Gera from the project, but also to validate an agent-based landscape change model. Maps with scenarios and assumptions of the model were discussed and debated with locals in a lively event that lasted well over its original schedule. Then, it was time for an olive oil tasting experience in the Avlonas tavern, performed for us (and with us) by the friendly and informative staff of the DIMITRA Research Station in Gera. We are now all little experts in olive oils and their qualities.